Excerpted by permission of THE NEW YORK TIMES MAGAZINE, ©2005. Modern Turkish women dress in styles from the East and the West. This jostling together of European fads, age-old rural folkways and Islamic fervor has been a fact of Turkish life for a long time, especially in big provincial cities like Bursa. Imitating Europe was already an Ottoman project when Mustafa Kemal Ataturk founded the Turkish Republic in 1923. But thereafter, the Europeanization of its citizens became the state’s mission, its raison d’tre even. This meant modernizing industry, mores and the Turkish language. Mostly it meant pushing Islam out of the public square. There were bans on headscarves in university classes and at state jobs. There were government-trained imams who gave government-issued sermons on Fridays. Elites tended to approve Ataturk’s vision; when they didn’t, a huge standing army could be summoned to defend it. Since the end of the cold war, the lid has come off Turkish life. Turkey’s population is growing by nearly a million people a year, even as emigration to Europe continues. Suat Kiniklioglu, who heads the Turkish office of the German Marshall Fund of the United States, says, “Urban Turkey is being overrun by the countryside.” Take Bursa. In the 1980s, the city had fewer than a million people. Now it is at 1.5 million and swelling daily with newcomers from both the surrounding villages and places like Tunceli. The western edge of Bursa is as modern and European as any place in Turkey, with malls, trimmed lawns, “Beware of Dog” signs and the Renault and Fiat plants that are the backbone of the country’s auto industry. But some of the newer apartment blocks near the Teleferik Family Tea Garden are home to people who work for village-level wages, practice a village-level piety and give their votes to the three-year-old Islamist government of Recep Tayyip Erdogan’s Justice and Development Party. Pious Muslims have begun to establish successful international businesses. Maybe “Islamist” is a simplistic way of putting it, but maybe not. What Erdogan has sought to do since his party came to power in 2002 is to resolve some of the cultural contradictions of Ataturk’s republic. The Turkish state has always tried to imitate the ways of Western democracies, but without giving the country’s Muslim middle and lower-middle classes much voice in the matter. Turkey’s masses are pious even by the standards of the Islamic world, though their piety has mostly been a private one, bearing scant resemblance to the authoritarian fundamentalism of the Saudi Wahhabis or the Iranian Khomeneiites. For almost all of the last century, they were too distant, too poor and too disorganized to demand a hearing. Yet whenever society has reclaimed a bit of power or freedom from the Turkish state, it has done so in the name of Islam or, at the very least, of traditional Turkish values. In a Turkish context, more democracy generally means more Islam. Since Sept. 11, the West’s biggest question about Turkey has been whether it forms part of the problem of an increasingly militant Islam or part of the solution. The E.U.’s rationale for welcoming Turkey into its councils and its economic sphere used to be a matter of “strategic rent,” compensation for its position at a crossroads of continents and military blocs. Today, says Soli Ozel, a political scientist at Bilgi University, what Europe sees in Turkey is “an example that a modern, secular democratic state and capitalist society is compatible with a Muslim population.” Europe has come to value Turkey not just for where it is but for what it is. About a third of the Justice and Development Party’s support comes from liberals who joined it in hopes that Erdogan’s commitment to the European project would bring them visa-free travel, investment opportunities or equality for women. It is an open question which part of Erdogan’s coalition is the dog and which the tail. He has shown signs of wanting to coax hard-line Islamists into the modernizing consensus. He has also shown signs of using Europe as a means to weaken the army to the point where he can pursue untrammeled an Islamist agenda of the sort he espoused a decade or two ago. 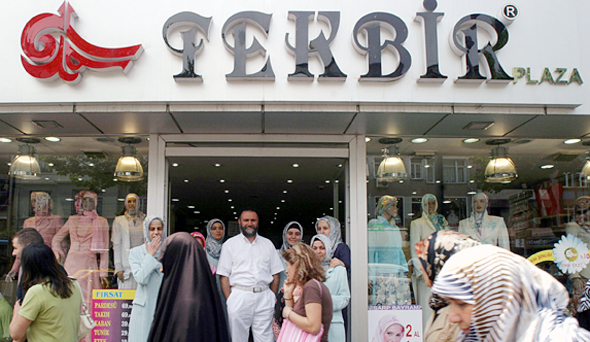 Two women working in Tekbir, Turkey’s largest Islamic-style clothing chain. One of Erdogan’s notorious pronouncements during his term as Istanbul mayor was that democracy was like a streetcar: “You ride it until you arrive at your destination, then you step off.” In the old days, he was one of those Islamist politicians who would not shake a woman’s hand. Turkey’s secular order still poses problems in his personal life – there have been state functions that his headscarf-wearing wife could not attend. And even as he has sought to Europeanize Turkey’s political structures, he has lost few opportunities to Islamicize its social ones. Weeks before his visit to Brussels last December to make the final push for the start of Turkey’s accession talks, he tried to change Turkish law to criminalize adultery. The A.K.P. has all but destroyed Turkey’s fledgling wine industry with punitive taxes. And Erdogan has decriminalized “clandestine” Koran courses, even though they have been a meeting place for radicals of the Iran-backed Turkish Hezbollah movement. Young Turkish women walking in a commercial center. More and more Turks share Ilicak’s view that Islam and its symbols are compatible with modernity, are perhaps even a sign of modernity: a woman who aroused no comment on a goat path migrates to a city and stands out when she takes a computer class or sits in Starbucks. “It’s not that people are more religious,” says Can Paker, a businessman and analyst at Tesev, an Istanbul policy center. 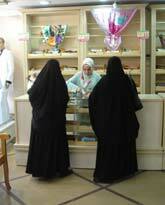 “It’s that they are more free.” And free, upwardly mobile women may choose to wear the veil for a variety of reasons. It can be a sign of solidarity with the family or small town left behind. It can be a marker of membership in a new rising elite. It can be simply chic. After all, the prime minister’s wife wears one. Christopher Caldwell, a contributing writer for THE NEW YORK TIMES MAGAZINE, is writing a book about immigration, Islam, and Europe.